If you’re suffering from nesting birds and/or unsightly droppings, don’t let the problem escalate. Cowleys Pest Services will get the birds out and keep them out for good. For residential customers, nuisance birds can be a big problem. Not only do their droppings create an unsightly mess they can pose a health threat to you and your family. Unfortunately, problem birds don’t magically go away and decide it’s time to bother someone else. Once they are settled in, you can assume they will be there for the long-term. To get rid of nuisance birds, you need an experienced bird control professional who can evaluate the problem and institute cost-effective bird-control measures that work. Commercial facilities require larger scale bird control tactics than smaller, residential buildings but many of the issues are consistent. Health risks are a significant threat, as well as property damage from their droppings or from the birds nesting. If your commercial facility needs its bird issues addressed, check out our commercial bird services. Bird control is a multi-tactic approach involving a variety of deterrents, most of them physical, such as bird spikes and netting. Effective long-term bird control requires behavior modification. The whole idea is to make your home inhospitable to birds so they go somewhere else. Cowleys Pest Services provides Free Estimates for safe and effective bird control in Edison, Woodbridge, Lakewood and nearby. We are experts in deterring nuisance birds, as well as taking care of the mess and damage they can leave behind. Call us or contact us online today for a free bird control quote in New Jersey! Bird spikes are a common bird deterrent used on top of homes and buildings. Cowleys Pest Services has the expertise to investigate and resolve the most complicated bird problem. We are also experienced in cleaning up bird droppings. Bird droppings are the health equivalent of toxic waste. Don’t subject your family to that sort of danger. Have a professional service with the right protective masks and equipment that is trained in hazmat procedures using the right cleaning products remove the bird droppings from your home. Have it done right and have it done safely. The best approach to suburban goose management involves a combination of methods, an integrated approach. When choosing appropriate methods, the pest control operator, working within applicable laws and regulations, must consider the characteristics at the site that are attracting geese and then devise a plan that reduces the preferred site characteristics.There is often a combination of short-term and long-term controls to have a successful program. Gull control is about keeping unwanted, nuisance Gull from landing, roosting, and nesting on structures using various deterrents. Deterrents may be physical, visual, or auditory. 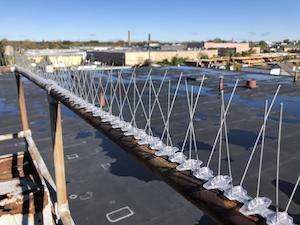 In urban and suburban settings, physical barrier deterrents are the most effective, practicable long-term pigeon solution. Each solution must be designed to resolve the particular Gull infestation at hand. Factors that must be assessed include the type of structure and the level of bird activity. In addition to choosing the right mix of deterrents, the proper installation by an experienced bird removal specialists is essential. 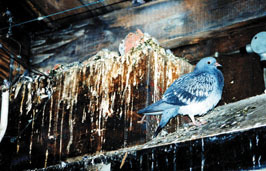 Cowleys Pest Services will make your home or property an inhospitable area for pigeons to land, roost, or nest. The objective is to have the pigeons take themselves and their droppings to another, friendlier location. With the right deterrents, the nuisance birds get the message loud and clear that your structure is an undesirable habitat once there is no longer enough real estate on your ledges and other areas to conduct their activities. Sparrows have been such a successful invasive species because of their rapid dispersal mechanisms, rapid easy establishment, rapid growth and aggressive competition with other species. One pair of sparrows can produce up to 20 chicks per breeding season. Sparrows are not exposed to the rigors and mortality of migration; they simply fly a few miles from the nest to take advantage of nesting sites and food sources available. The Starling is a non-native invasive bird that was introduced to North America. They thrive “in nature” as well in urban and suburban areas. Ideal nesting habitats include areas with trees or other structures that have cavities suitable for nesting including pockets and spaces in building walls. In the winter, these birds will look for warmth inside structures such as warehouses. One of the more serious health concerns is the fungal respiratory disease histoplasmosis. The fungus Histoplasma capsulatum contained in the bird droppings grows in the soils beneath bird roosts. The disease-carrying spores become airborne in dry weather, particularly when the site is disturbed, and can be inhaled. Woodpeckers breed in the spring and typically lay between two and six eggs. The key to reducing damage is to act quickly when damage first begins. Woodpeckers can be very persistent and their habits hard to break as they continue to damage buildings and trees while searching for food or a place to nest. Cowleys Pest Services has the experience and expertise to manage the most challenging bird control issues by using the right deterrents to keep them away. Call or contact them today for a free inspection and estimate in Edison, Woodbridge, Lakewood and the surrounding areas.